Domica is the biggest and the most beautiful cave of the caves in the Slovak Karst (Slovenský kras). It is situated in the southern slope of the Silicka Plain (Silická planina) at the altitude 339 m and on a protected area of 616 ha (6,16 km2). Together with the neighboring cave Baradla in the Hungarian republic it creates a huge 25 km long complex. The length of cave tunnels in the Slovak part of the territory is 5368 m out of which 1315 m are open to public. In the Later Stone Age (Neolithic period) the cave was an economic and cultural center of the local population. In the cave they built shelters, performed religious activities and with torches they explored dark rooms of the cave trying to find new sources of water and high quality clay. After a natural disaster covered up the original cave entrance with soil, the cave stayed uninhabited. The cave was discovered on October 3, 1926 by Ján Majko. He founded one of the four natural entrances of the cave system. The cave was open to public on June 1, 1932, after a new entrance was dug. Today’s exit of the cave was dug in 1958. The object at the cave entrance from J. Bebjaka was built in 1984 with the purpose to prevent occasional cave floodings (the last time in 1981). 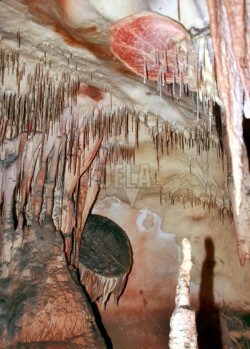 The cave has beautiful ornamentation of a number of stalactites and stalagmites. Among the most important karst formations we can mention: Majkov House (Majkov dóm), House of Indian Pagodas (Dóm indických pagod), Jewel Box (Klenotnica), Diamond Cruise (Diamantová plavba) and a Primaeval Forest (Prales). Under the cave flows the underground creek called Styx. Visitors can raft through a 150 m long section. Since 1995 the cave has become a part of the world natural and cultural heritage of UNESCO.